Have we finally seen the last of the snow for this year? It’s now officially spring, so let’s hope the sun can drive away the wintry gloom and we can enjoy the feel of warmth on our faces. 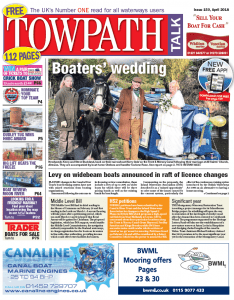 Something to bring warmth to your heart is the front page of the April issue of Towpath Talk, which is out now! 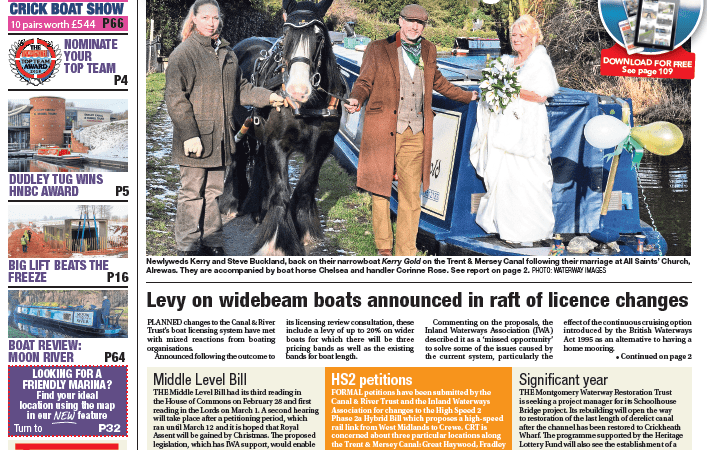 Boating couple Kerry and Steve Buckland tied the knot at All Saints’ Church, Alrewas, and a wonderful time was had by all, including their friends, who braved the chill to allow the couple to emerge from church beneath an arch of boat shafts! Editor Janet Richardson travelled from Towpath Talk’s Lincolnshire offices to the Houses of Parliament to present a full-page report from a meeting of the All-Party Parliamentary Group for the Waterways – read her in-depth report on various topics on page 3. Janet chats to a couple who have traced their family’s waterway roots back to the 1660s, and she also presents a delightful array of photographs from her trip to Carrick, county town of Leitrim in Ireland. Our packed pages of news hold something for everyone, and there are plenty of forthcoming events listed for Easter and beyond. If you are an avid stargazer, towpath astronomer Brian Jones points out the pride of the night sky, the constellation of Leo. With all the snow clouds of late obscuring the celestial scenery, it hasn’t been easy to enjoy watching the heavens but a starry sky will now display a totally different view of the universe to that of a couple of months ago. Enjoy! And don’t forget to put your clocks forward by an hour when you go to bed on Saturday night (March 24), as British Summer Time starts on Sunday. All those lovely light evenings will soon perk up our spirits and get us out on the waterways! And if you’re looking for a new boat, or simply want to get to know a little bit more about the waterway network before you choose a marina or a craft, Towpath Talk and its advertisers can give you plenty of helpful and friendly tips. 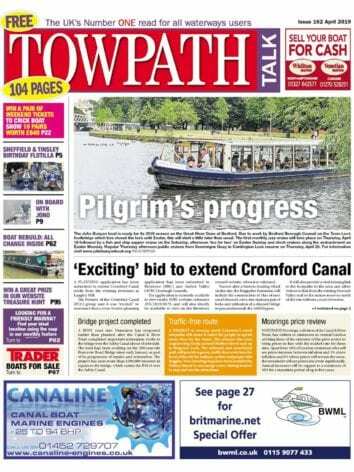 Next Post:Towpath Talk April digital issue now available!